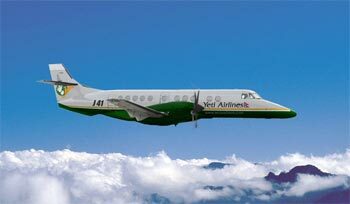 The domestic airlines in Nepal operate an extensive network of air service in the interior parts of Nepal. It has scheduled connection flights from Kathmandu to TapIeJung, Bhadrapur, Rajbiraj, Bhojpur, Phaplu, Lukia, Lamidanda, Tunmlingtar, Rumjatar, Biratnagar, Simra, Janakpur, Ramechhhap, Bharatpur, Meghauli Pokhara, Jomsom, Manang, Baglung, Bhairahawa Nepalgunj Chaurjhahari, Surkhet, Dang, Dolpa, Jumia, Bajura, Baitadi, Dipayal, Darchula, Mahendranagar, Dhangadi, Tikapur and Sanfebagar. Beside Royal Nepai Airlines the other domestlc airlines such as Buddha Air Nepal, Yeti Airlines Nepal, Tara Air Nepal, Guna Airlines Nepal, Agni Air Nepal, Sita Air Nepal, Nepal Airlines Nepal, Cosmic Air Nepal, Gorkha Airlines Nepal, Skyline Airways Nepal, Shangri-La Air Nepal, Nepal Airways, Everest Air, Asian Helicopters, Necon Air and Lumbini Airways also provide regular and charter services to different popular destinations. The Nepal Airlines and other domestic airlines operate an extensive network of air service in the interior parts of Nepal. A major domestic carrier besides Royal Nepal airlines operating in the Nepali skies includes Buddha Air, Yeti Airlines, Tara Air, Guna Airlines, Agni Air, Sita Air, Nepal Airlines, Cosmic Air, Gorkha Airlines, Skyline Airways, Shangri-La Air, Nepal Airways, Everest Air, Asian Helicopters, Necon Air and Lumbini Airways All privately owned and operate. With our well equipped ticketing staffs, we are always in the position of reserving and issuing the tickets to any of the domestic region of the country including the breathtaking mountain flights (an hour flight over the Mountains to the Everest & back). In Nepal, the regions in mountains and high Himalayas are not well connected with roads and highways. People are forced to walk several days and carry the goods by animals to reach to the convenient urban place. Considering the same and the government of Nepal has built several airfields with Short Take off and Landing (STOL) facilities and even the cost for the domestic air-tickets has been subsidized for its people. However, attractive fares for tourist have also been worked out for the places which are considered as the important tourist destination. Write to us for more information and reservation.